Paul Strassmann’s blog: 047. Is the Stock Market Overvalued or Underpriced? 047. Is the Stock Market Overvalued or Underpriced? There is a variety of methods for evaluating the worth of the US stock market. We are basing our overall view by using the work of the Nobel Prize winner, prof. Shiller from Yale as a method for making an evaluation of the stock market. This illustration shows that from 1945 through 2000 the earning capacity of the corporations included in the S&P (e.g. 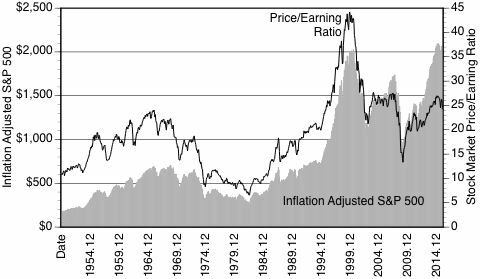 the Price/Earning ratio) has always showed a premium price for earnings. During this period the stock market delivered good returns. Starting with 2006 the worth of the S&P started exceeding the P/E ratio, with recent history (through Feb 2016) showing S&P exceeding the P/E by large amounts. CONCLUSION: There is no question that by historical comparisons the current valuation of the S&P 500 is materially overvalued using Yale university criteria.